Hi guys! Most of our staff is without power, internet is spotty, and we’re waking up to a severely impacted city. 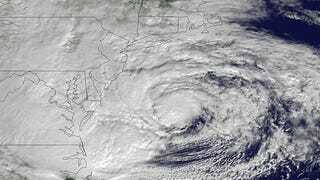 Here is a crazy series of photos showing the ground in New Jersey disappearing. Check out this pic of a tanker ashore on Staten Island. This picture of a subway station is terrifying. Sandy is serious business! Hope everyone out there is safe and well.